"In carrying into effect these principles, and in suppressing the attempts to evade and resist them, and in order to maintain the Constitution and execute the laws, it became necessary to interdict commerce at those ports where duties could not be collected, the laws maintained and executed, and where the officers of the Government were not tolerated or permitted to exercise their functions. In performing this domestic municipal duty, the property and interests of foreigners became to some extent involved in our home questions, and with a view to extending to them every comity that the circumstances would justify, the rules of blockade were adopted, and, as far as practicable, made applicable to the cases that occurred under this embargo or non-inter-course of the insurgent States. The commanders of the squadron were directed to permit the vessels of foreigners to depart within fifteen days, as in cases of actual effective blockade, and then vessels were not to be seized unless they attempted, after having been once warned off, to enter an interdicted port in disregard of such warning." 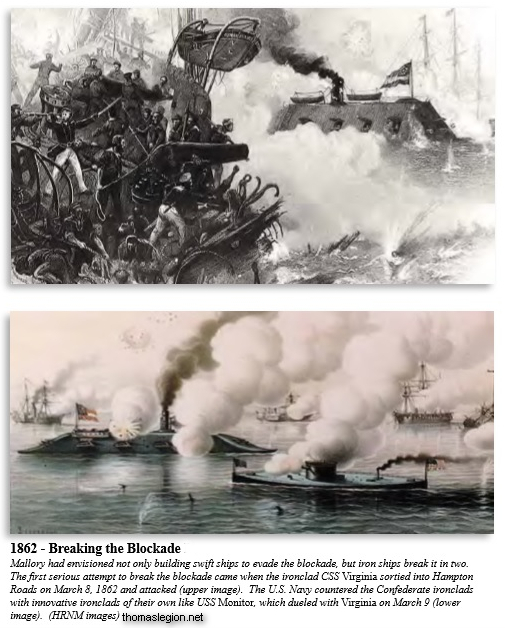 Whether a blockade is initiated as a blockade by notification or as a blockade de facto, the indispensable condition of its establishment is the presence of a force at the blockaded port. Actual notice of the fact can never precede the existence of the fact. The President's two proclamations did not therefore constitute actual notice, because at the date of their issue there was not even a pretence that the blockade existed. Nor do they appear to have been so intended. The idea was rather to publish a manifesto declaring in a general way the intentions of the Government, and then to carry them out as promptly as circumstances would permit. It is probable that when the blockade was proclaimed it was thought that the measure could be adequately carried out by stationing a small squadron at the principal commercial ports, supplemented by a force of vessels cruising up and down the coast. The number of points to be covered would thus be reduced to four or five on the Atlantic and as many more on the Gulf. Had this expectation been realized, the blockade would have been by no means the stupendous undertaking that it seemed to observers abroad. Acting upon such a belief, the Government entered upon its task with confidence and proceeded with despatch. The Niagara, which had returned from Japan on April 24, was sent to cruise off Charleston. The Brooklyn and Powhatan moved westward along the Gulf. Before the 1st of May, seven steamers of considerable size had been chartered in New York and Philadelphia. One of these, the Keystone State, chartered by Lieutenant Woodhull, and intended especially for use at Norfolk, was at her station in Hampton Roads in forty-eight hours after Woodhull had received his orders in Washington to secure a vessel. The screw-steamer South Carolina, of eleven hundred and sixty-five tons, purchased in Boston on May 3, arrived off Pensacola on June 4; and the Massachusetts, a similar vessel in all respects, and bought at the same time, was equally prompt in reaching Key West. When the advantage of a neutral destination was fully understood, it became the practice for all the blockade-runners out of European ports to clear for one or the other of these points, and upon their arrival to wait for a favorable opportunity to run over to their real destination. Nobody could be deceived by this pretence of an innocent voyage; and the courts, looking only at the final destination, condemned the vessels when there was evidence of an ultimate intention to break the blockade. This decision rested upon an old principle of the English prize-courts, known as the doctrine of continuous voyages, according to which the mere touching at an intermediate port of a vessel engaged in an illegal voyage could not break the continuity of the voyage or remove the taint of illegality. Hence, if a vessel cleared from Liverpool with the intention of merely touching at Nassau, and then proceeding to Charleston, and if this intention could be proved from the papers, the character of the cargo, and the examination of persons on board, the two voyages were held to be one, and condemnation followed. The adoption of this rule by the highest courts in the United States raised a loud outcry on the part of those interested in the traffic, trod was severely criticised by implicists abroad, especially by those who favored, in general, the continental view of the laws of war. The United States were accused of sacrificing the rights of neutrals, which they had hitherto upheld, to the interests of belligerents, and of disregarding great principles for the sake of a momentary advantage. In truth, however, the principle adopted by the court was not a new one, though a novel application was made of it to meet a novel combination of circumstances. It had formerly been applied to cases where neutrals, engaged in illegal trade between two ports of a belligerent, had endeavored to screen the illegality of the voyage by the interposition of a neutral port, with or without the landing of goods and the employment of a new conveyance, in these eases Lord Stowell held that the continuity of the voyage was not broken, unless the cargo was really imported into the common stock of the neutral country. That the principle had not been applied to blockades was due to the fact that circumstances had never called for it, as the practice of breaking a blockade had never before been carried out on such a scale, with such perfect appliances, and by the use of such ingenious devices. The really difficult question before the court was as to the sufficiency of the evidence in each case. It was to be expected that every artifice in the nature of simulated papers, pretended ownership, false destination, and fictitious transfers would be adopted to escape liability; and it was the business of the court to penetrate all these disguises, and to ascertain the real character of each transaction. 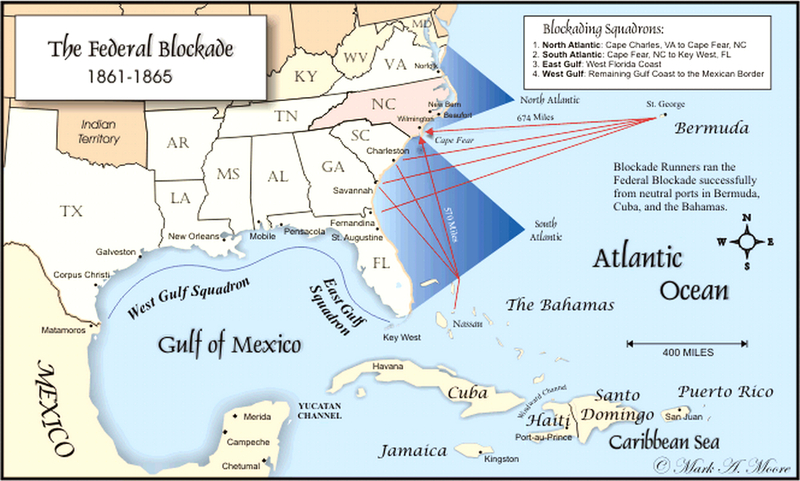 It is probable that in no case was injustice done in brushing aside and disregarding the various ceremonies, more or less elaborate and artificial, that were performed over blockade-running cargoes at Nassau and Bermuda; and it must often have happened that the ingenuity of shipper's was rewarded by a decree of restitution for the want of technical evidence, when there was no moral doubt as to the vessel's guilt. The instructions were perfectly general in character, naming no particular port or country. The agents of the blockade-runners, however, styling themselves merchants of Nassau, adopted a tone of righteous indignation, and actually had the effrontery to complain of this "unjust discrimination'' against what they ingenuously called the trade of the Bahamas. As if, indeed, the Bahamas had had any trade, or Nassau any merchants, before the days of blockade-running! They succeeded, however, in persuading Earl Russell to take up the diplomatic cudgels in their behalf; but from the long correspondence that followed, the English Government, being clearly in the wrong, derived little satisfaction, and a stop was put to the traffic. As the war went on, the naval forces, securing the cooperation of small bodies of troops, gradually obtained a foothold at various points and converted the blockade into a military occupation. These points then became the headquarters of the different squadrons--ports for rendezvous, refitment, and supply, for the "repairs and coal" that were forever drawing away the blockaders from their stations at critical moments. By the spring of 1862 all the squadrons were well provided in this respect, though some of the centres of occupation were occasionally recovered by the enemy. Especially on the coast of Texas, blockade and occupation alternated at the different Passes throughout the war, partly in consequence of the want of troops to hold the occupied points. Curiously enough, too, these centres of occupation became in a small way centres of blockade-running--Nassaus and Bermudas on a diminutive scale. Norfolk, Beaufort in North Carolina, Hilton Head with its sutler's shops, Pensacola, and New Orleans each carried on a trade, prosperous as far as it went, with the surrounding coast. At New Orleans, the blockade of Lake Ponchartrain was kept up long after the city was taken, not to prevent access to the port, but to capture the illicit traders that cleared from it; and Farragut was obliged to remonstrate sharply with the Collector for the readiness with which papers covering the trade were issued by the custom-house.